The Scroll by K.B. Hoyle is the fifth book in The Gateway Chronicles. It will leave you breathless. I was introduced the series when The Six (book 1) was first being published by The Writer’s Coffee. Darcy our intrepid heroine was not very likable, Tellius her betrothed was immature (lol) and the plot had a “coming of age” feel to it. A promising series that was reminiscent of The Lion, The Witch and The Wardrobe, but with more teenage angst. Then I got a bit behind on my reading. I didn’t start The White Thread (book 3) until May this year. When I finished that, I began immediately on The Enchanted (book 4), both awesome novels, further describing the evolution of a group of young friends and their ever changing relationships. 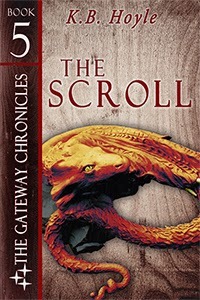 The Scroll, however was not due for publication until many months later and yet I found myself so involved in the series that I didn’t want to wait. So *insert diabolical laugh here, I used my position in The Writer’s Coffee Shop to gain access to The Scroll (book 5) ahead of schedule #NICEPERK :) The only problem I had then? 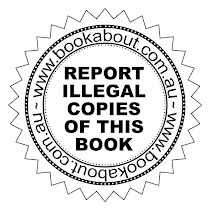 The Bone Whistle (book 6) was (is still) not due for release until 2014! I even spoke to KB to try and source an early copy, but at the time, it hadn’t even been written AND no perk in the world was going to alleviate that particular crisis. The Scroll is a devastatingly awesome read, but it ends in a place that will leave you desperate for the next installment. It’s not a bad ending, in fact it ends in line with every other novel in the series - a bit like each Harry Potter novel ending at the end of a year at Hogwarts. I would also equate the ending of the scroll to the ending of Harry Potter and the Goblet of Fire - you just know that nothing will ever be the same again. Darcy Pennington may once have been an average teenager, but not anymore. Living each year twice, once in her world and once in Alitheia, has made her into someone who cares little for normal teenage activities. She’s got more important things to do, like save the mythical, magical world of Alitheia. But this time, Darcy can’t save Alitheia until she saves Tellius, the love of her life. A window between the worlds allows Darcy to see Tellius from her home in Chicago. But, far from being reassured, she plunges into despair when she sees Tellius captured, imprisoned, and tortured. All her plans for her future life in Alitheia are put on hold as Darcy faces a singular goal: save Tellius, even if it means giving Tselloch something in return. Intrigue is high upon her return to the castle, where old friends tell new lies, best friends hide crucial secrets, deceptive apparitions roam the halls, and betrayal lingers around every corner. The only way to unravel the mysteries and protect Alitheia is to bring Tellius home, but Darcy lacks the necessary magic for that. As time runs low, Rubidius keeps to himself, and even Sam has her own secret this year. Darcy wonders if anyone else cares the way she does, and why it’s always a fight to get anything done. Still, she’ll do anything to rescue her future husband, including surrender herself to the fate she knows is coming anyway. Now, if only The Six could unveil the scroll, they might learn the greatest secret of all, before everything burns to ashes around them. K. B. Hoyle has been a classical educator for several years. She is a wife to a wonderful husband and mother to three wonderful little boys. At a young age, she knew she wanted to write stories that would inspire people. Her favorite genre had always been Young Adult Fantasy and Science Fiction, so that is where her journey began. K. B. wrote her first fantasy novel at the age of eleven, which proved to be great practice for the novels she would publish as an adult. 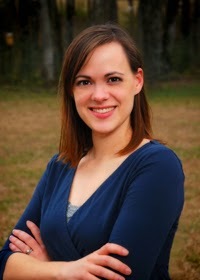 K. B. is currently writing the Young Adult Fantasy series The Gateway Chronicles, but she never stops brainstorming all the stories she plans to write in the future.